Increased rice acreage and yields in 2018 have suppressed prices, according to an LSU AgCenter economist who says that trend is expected to continue. “Production was up for all rice by 23 percent,” said Michael Deliberto. Deliberto said U.S. rice acreage increased by 528,000 acres in 2018, or 22 percent, from 2017, and most of that increase was in Arkansas. Louisiana’s acreage increased by almost 10 percent to 434,123, compared to 391,071 in 2017. According to the U.S. Department of Agriculture, Louisiana’s average yield in 2017 increased from 6,710 pounds an acre to 7,000 pounds — still below the 7,600-pound record set in 2013. The USDA statistics show the U.S. average yield was 7,563 pounds, up from 7,507. California also had a slight increase, and the Arkansas yield was roughly the same as 2017. Missouri, Texas and Mississippi had slight decreases. Deliberto said exports increased by 13 percent from 2017. Part of that increase was two major sales to Iraq. “But we can’t ignore the facts that a large part of our rice exports go to Latin America,” he said. Deliberto said potential exists for increased medium-grain sales in the Middle East because of water restrictions in Egypt, a country that has gone from a net rice exporter to a net importer. The U.S. Department of Agriculture price forecast for long-grain rice is for $11 a hundredweight ($17.82 per barrel, or $4 per bushel). The USDA forecast for medium-grain is $11.10 per hundredweight. Lower prices for U.S. rice make the American commodity more competitive on the global market, he said. But Deliberto said the demand, even with increased exports, is not enough to offset the large supply. Besides forecasting the rice market, Deliberto works on several other projects, including one to chart energy costs for drying rice, a budget model for row rice in north Louisiana, and rent and cash flow models. After two challenging years, most Louisiana rice farmers had a good crop in 2018. For the first time in three years, Louisiana rice farmers did not have to deal with a tropical weather system. “Good but not great,” is how Don Groth, resident coordinator of the H. Rouse Caffey Rice Research Station, described the 2018 crop. Groth anticipates the average yield in Louisiana will exceed 7,000 pounds an acre — less than the record of 7,600 pounds in 2013 but better than the past two years, which were less than 7,000 pounds. An excellent ratoon crop could push the crop to the state’s second-best overall harvest, said Dustin Harrell, the LSU AgCenter rice extension specialist. Groth said growers benefitted from minimal pest and disease problems. “I hardly saw any stink bugs this year,” he said. Harrell expects the state’s rice acreage to be about the same in 2019 but that could change. “It’s too early to predict anything because the market could change between now and then,” he said. Northeast Louisiana growers have the flexibility to shift to other commodities if those prices improve, he said, and it’s possible that soybean acreage there could shift to rice if soybean prices remain low. He expects more acreage in northeast Louisiana to be grown in furrow-irrigated rice, which is also called row rice. The amount grown with that practice doubled in the past year. Keith Fontenot, a research associate with the LSU AgCenter Rice Verification Program, said farmers faced several challenges early in the season with cool weather followed by hot, dry weather. He said farmers are now looking at cutting expenses without risking production levels. Producers were generally pleased with the outcome, but they were hoping for better prices. Crop consultant B.D. Fontenot said rice farmers had a better-than-average crop. He said sheath blight became a problem for some that could not be controlled with Amistar Top fungicide, but an earlier application is probably needed, he said. Insects were not as much of a problem, he said. “I don’t think the rice acreage is going to change a whole lot next year,” Fontenot said. Across the state, rice producers saw slight differences in conditions and outcomes. Jeremy Hebert, an LSU AgCenter agent in Acadia Parish, said growers there had a good year. Growing conditions were good, and grain quality was very good, Hebert said. Rain and reduced sunshine at pollination didn’t seem to have as much of an effect as expected. Yields were mostly in the upper 40-barrel range (more than 145 bushels or 65 cwt.) with some in the upper 50s (more than 180 bushels or 80 cwt.). He said disease was mild. “The pressure wasn’t as bad as we thought because we had a lot of rain in June,” he said. Insect pressure was light, Hebert said, and most growers did not spray for stink bugs. Second crop reports also were good, he said, with many growers reporting 28 barrels (100 bushels or 45 cwt.). “There are second-crop fields that look like first-crop fields,” Hebert said. Rice acreage in Acadia Parish probably will stay about the same, Hebert said, but he expects crawfish acreage to increase in 2019. “Farmers seem optimistic for next year,” he added. Frances Guidry, an LSU AgCenter agent in Jefferson Davis Parish, said main crop yields there were mostly in the 40-barrel range, and second-crop yields were around 15 barrels (54 bushels or 24 cwt.). Andrew Granger, an LSU AgCenter agent in Vermilion Parish, said farmers had an average year overall. “It’s better than the last two years,” he said. Some had excellent first crop yields for Vermilion Parish, he said, with a few making over 50 barrels (180 bushels or 81 cwt). Fields that could be mowed or rolled after the first harvest were having “decent” second-crop yields 5 to 7 barrels higher, he said. He agreed that disease and insects were not as much of a problem. To cut costs, Granger said many farmers have returned to conventional varieties, such as Cheniere and Mermentau, with pinpoint flooding even though the yield might only reach 40 barrels (145 bushels or 65 cwt.). “They’re trying to make as cheap of a crop as possible,” he said. For 2019, Granger expects acreage to remain about the same. Vermilion Parish rice acreage increased by almost 4,000 acres in 2018 from the previous year to a total of 49,182. Christian Richard of Vermilion Parish said his crop was slightly above average. “It wasn’t nearly what it was in 2013 or 2014,” he said. Richard said a dry May and June on his farm were followed by a wet July. “Once August started, it seemed like it rained every day,” he said. That continuous rain complicated harvest, he said. He was late getting started on harvesting a second crop because he ran out of bin space because of soybeans he hadn’t been able to sell. “Who would have thought we could not get rid of one of the better bean crops we ever had?” he said. Richard said he will continue with the same amount of rice acreage in 2019, and he anticipates a larger percentage will be planted in Provisia to address weedy rice problems. Jimmy Meaux, an LSU AgCenter agent in Calcasieu Parish, said the 2018 crop there was average — a bit better than the previous year. He estimated the average yield to be slightly above 40 barrels. Some areas in southwest Louisiana were hit with heavy rain at flowering, which affected yield, he said. He expects 2019 rice acreage to remain about the same and possibly increase because of an anticipated decrease in soybean plantings. Keith Collins, an LSU AgCenter agent who works with rice farmers in northeast Louisiana, said farmers there made a good crop, but the harvest was complicated. Some farmers were delayed as long as a month to get their crop out of the fields, he said, and that affected quality. He expects an increase in rice acreage in the northeast part of the state because of low prices for other commodities. “I think the majority of that is going to be with row rice,” he said. “We probably had one of the better yields we’ve had,” he said. He said his hybrid crop of more than 300 acres produced an average of about 200 bushels. He said he had to leave about 30 acres that stayed wet too long in the field. Marsh said he grew all his crop using the row rice system because it saves money on pumping costs and on land work. He said he will plant rice next year, but he’s not sure how much because of the uncertainty with most commodities now. Todd Fontenot, an LSU AgCenter agent in Evangeline Parish, said 2018 wasn’t a banner year for farmers there. “Across the board, yields are down a little bit, but they are still good,” he said. Fontenot said farmers had to pump through much of the summer to keep fields flooded because of excessively dry weather. “It’s going to be an expensive year,” he said. He said more farmers seemed to have problems with weedy rice, and longer times to flood up fields that had dried may have allowed weeds to gain a foothold. Night temperatures were high early in the season, and that could have affected yield, he said, but disease and insect pressure were light. Like other areas, the harvest in Evangeline Parish was hampered by rain, he said. Fontenot expects Evangeline Parish acreage to slip in 2019 or remain the same because of prices. “Some are saying they are not going to plant because of the price except where they have crawfish,” he said. Ross Thibodeaux, who farms in the Midland area, said the first crop probably averaged 50 barrels, and the second crop average could be as high as 30 barrels. “It was a pretty good year,” he said. But Thibodeaux couldn’t say the same thing about what he got for his crop. “The price needs to go back up where it started this year,” he said. Genetic marker technology is leading to a more efficient process for developing new varieties. Recently, the technology was used at the H. Rouse Caffey Rice Research Station near Crowley to find a new gene for Cercospora resistance. After three years of field testing, this gene appears to confer complete resistance in the materials in which it has been tested. The discovery and validation of this gene is a major component of graduate student Christopher Addison’s doctoral research. “The discovery and validation of the new Cercospora gene is another tool we have in our efforts to breed improved varieties with enhanced disease resistance,” said Adam Famoso, LSU AgCenter rice breeder. In addition to Cercospora, the rice breeding program has developed and validated DNA markers for multiple traits, such as plant height, grain shape, amylose, gel temperature, aroma, herbicide tolerance, pubescence and multiple blast resistance genes. The plants are grown in a greenhouse, then DNA is extracted from the plant tissue and tested to determine which lines contain the desired trait before anything is planted in the field. If the desired characteristics are found, the seed is planted in progeny rows. Amistar Top, a new fungicide, made its debut in 2018 with mixed reviews. Some farmers gave it a thumbs-down because their fields were hit with heavy concentrations of sheath blight. He said testing had been done on strip plots using ground-rig sprayers that allowed for good penetration into a plant. “It performed very well in these tests,” Groth said. Spraying Amistar Top earlier — at five days after panicle differentiation — was more effective than the usual boot stage because the canopy was more open, allowing the fungicide to penetrate the understory of the plant canopy, Groth said. He also said Amistar Top’s effectiveness seemed to improve when it was mixed with Tilt fungicide, an emulsifiable concentration that may act as a surfactant and help spread more of the product into the lower canopy. The winter nursery in Puerto Rico continues to help save time in the development of new rice options for farmers, researchers say. In the spring of 2018, more than 400 experimental rows were selected and harvested in Puerto Rico and immediately planted into plots for yield testing at the H. Rouse Caffey Rice Research Station near Crowley. “We harvested that rice in Puerto Rico on a Wednesday, and it was all planted into plots on station in nine days,” said Adam Famoso, LSU AgCenter rice breeder. All those rows were from lines of rice developed the previous year. “That is two years off the breeding process,” Famoso said. The new Provisia line, PVL108, was grown in 100 rows in Puerto Rico. It produced 60 pounds of seed, which was brought back to the Rice Research Station for a seed increase. In 2017, Hurricane Maria devastated the island. While the nursery at Lajas was relatively unharmed, the storm’s aftermath and cleanup delayed planting. The nursery also is vital for expediting hybrid development. Female plants for the hybrid project require specific environmental conditions, such as warm winter temperatures and the short day lengths that occur in Puerto Rico. The hybrid breeding program relies heavily on the Puerto Rico winter nursery to advance new crosses. Male sterile lines are required to make hybrids. Certain lines will be pollen-sterile during the summer in Louisiana but produce fertile pollen when grown in the winter nursery in Puerto Rico. Oard said the nursery allows for a seed increase and to advance generations quicker with extra growing seasons. He credited farm manager Anthony Rivera for the well-run facility. Last year, he said, the usual planting in Puerto Rico in October had to be delayed until December because of Hurricane Maria. “That did cause us to get less than optimum seed yields,” he said. But the amount of seed was enough for selection and purification purposes, Oard said. In 2018, farmers grew Provisia rice commercially for the first time, and the reaction to the technology’s weed-control capability was positive. Webster said Provisia’s weed control proved effective on grasses and weedy rice that could not be controlled before. “If I had a difficult-to-control grass, I wouldn’t hesitate to use Provisia,” he said. Webster is continuing to study the use of crop oils and adjuvants with the Provisia herbicide. He said he obtained a proprietary crop oil called Dash, which is no longer available in the U.S., that helps to reduce antagonism when Provisia is mixed with some herbicides. “However, it is not a silver bullet for reducing antagonism from all herbicide tank-mix options,” Webster said. Tests conducted in 2018 showed that a tank mix of Provisia with ammonium sulfate causes the herbicide to work more slowly. Loyant herbicide caused some injury on rice, but the biggest problems were reported in Texas on hybrid rice, Webster said. Loyant requires moisture to be effective, he said. The 2018 growing season started cool and damp but turned hot and dry suddenly. The herbicide was less effective than expected on grasses, he said, but it worked well on broadleaf and aquatic weeds. Loyant doesn’t seem to volatilize after spraying, according to Webster, but it will drift offsite because of wind or temperature inversions. Gambit herbicide is proving to be a good burndown herbicide at the optimal rate of 1.5 ounces per acre. It has good activity on sesbania, eclipta and sedges. “I like it post-emergence on alligatorweed,” Webster said. Webster said benzobicyclon could be labeled and available for use on rice in Louisiana in 2019. California producers were able to use it in 2018, and Webster said it showed excellent results on aquatic weeds and worked especially well on ducksalad. Insect research under Blake Wilson, an LSU AgCenter entomologist, continued in 2018 with several ongoing projects. Foliar applications of Prevathon, manufactured by FMC Agricultural Products, are showing good effectiveness against stem borers, Wilson said. The product is already in use in sugarcane, and a label for rice will be pursued, he said. A study of spatial distribution of rice water weevils and stem borers continued in 2018 has shown the highest densities of the insects are found on the edges of fields, Wilson said. This work could lead to a variable rate of insecticide used across a field, with the largest amount applied on a field’s outside acreage. Wilson said insecticide trials were conducted on new seed and foliar treatments. He said a test of using Dermacor with neonicotinoids is showing promise to address a wider range of insects. He said the second year of a Dermacor rate study showed a reduced amount of the product can still be effective when used in tandem with other seed treatments. Wilson said a study conducted by graduate student James Villegas continued this year to determine which varieties best tolerate rice water weevil infestation. He said the study is showing that hybrids have lower yield losses than inbred varieties. Row rice tested on three farms in north La. LSU AgCenter researchers are developing best management practices for growing row rice in north Louisiana. Row rice is planted on flat ground without levees. Polypipe is used for irrigation to keep the soil moist, and fields are not flooded. Three on-farm sites were used in the study, the Jason Waller farm in Morehouse Parish, the Darrell and Donnie VandeVen farm in Tensas Parish and the Elliot Colvin farm in Richland Parish. “I think we got a lot of good information this first year,” said Keith Collins, an LSU AgCenter agent. The data should help establish guidelines for fertilizer amounts and application timing, he said. Also, hybrids and varieties are being evaluated for their use as row rice. Collins said the fields in Richland and Morehouse had severe weather episodes that resulted in lodging that reduced yields in variety evaluations, but field yields were good. The yield on the Richland Parish field was 235 bushels (65 barrels or 105 cwt. ), compared to 216 bushels (60 barrels or 97 cwt.) in Morehouse and 239 in Tensas (66 barrels or 107 cwt.). Water pumping totaled 21.2 inches in Richland Parish and 25 inches in Morehouse. Water on both of those fields was retained with gated field drains. In Tensas water was not retained, and the pumping totaled 29.7 inches. Collins said moisture sensors at the field were monitored remotely to help determine when watering was needed. With rain and pumping, the Tensas field received 48.5 inches of water, compared to 36.3 inches in Richland and 46 inches in Morehouse. Two hybrids, XL745 and XL753, were used at all three test sites, and Gemini was used only in Morehouse Parish. Cheniere and CL153 were the two pure line varieties in the project. Collins said the study also will help producers with more baseline research data that could result in crop insurance policies being written for this practice. The VandeVen brothers have used row rice since 2015. This year, they had 150 acres of rice. “This was our fourth crop with it, and it has worked real well for us,” Darrell VandeVen said. 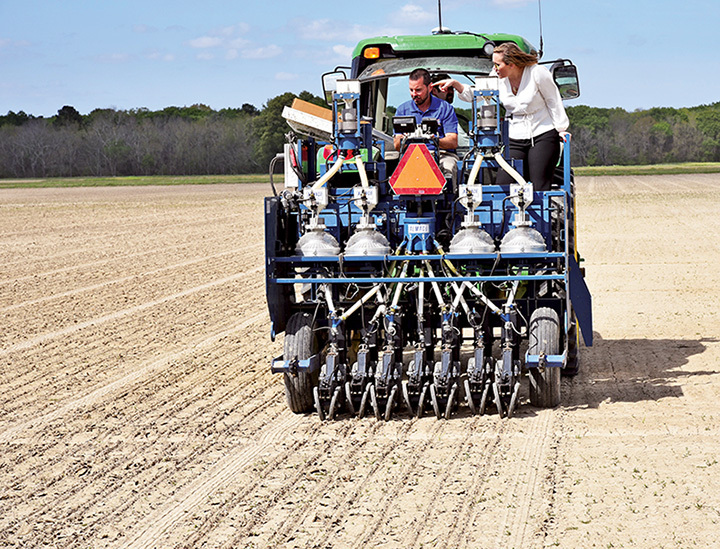 The VandeVens also grow cotton, corn and soybeans, and row rice gives them more flexibility at planting time. He said they prepare all their fields the same in the fall, and they don’t have to decide until the spring what to plant. Using a hybrid is essential, he said, because of the disease resistance. With row rice, they don’t have to make levees and then flatten them to plant a different crop, he said, and they save water and pumping costs. “We don’t even have a levee plow, and I’ve never installed a levee gate,” VandeVen said. He said irrigation is done often enough to prevent the ground from drying. They irrigate once a week in the early part of the season. Then, as days get longer and hotter, the interval is reduced to every five to six days. By late June or early July, watering is done every three days. Weed control requires starting with a clean field and using a pre-emergence herbicide early. He said they used three fertilizer applications 10 days apart, all just before watering. Darrell VandeVen said they have gotten calls from several farmers interested in the method. “It’s a natural fit for someone who’s never grown rice before,” he said. In other parts of the world, soil-borne arbuscular mycorrhizal fungi are helpful to some crops, improving the uptake of nitrogen and phosphorous and providing other benefits. For her doctoral dissertation, Lina Bernaola, a graduate student in the LSU Department of Entomology, has been studying whether arbuscular mycorrhizal fungi (AMF) can help rice plants with insect resistance and improved rice growth. However, the effects of these fungi have varied depending on the species of AMF, the crop species and soil conditions. Bernaola said this is the first time the AMF has been tested in rice in the southern U.S.
Bernaola first tested the effect of AMF in rice resistance to the rice water weevil and fall armyworm as well as the sheath blight pathogen. In all of these she found that rice plants inoculated with AMF were more susceptible to these pests in this test. However, the nutritional analysis (nitrogen and phosphorous) of root and shoot tissues indicated no major changes in the concentration of nutrients that can explain this susceptibility. She also tested if the effect of AMF is soil dependent. The results in rice were mixed, she said. In a test at the H. Rouse Caffey Rice Research Station near Crowley, inoculation with mycorrhizae showed inoculated plants benefitted from some insect resistance, but in a test near Mamou they showed no advantage. Bernaola said that could be explained because the soil near Mamou lacks phosphorous, which mycorrhizae needs to thrive. In addition, she demonstrated that all rice-producing areas in the southern U.S. have the natural presence of this fungi, which can be used for future research. Bernaola also showed AMF used on rice in field experiments provided tolerance against weevils after the insects fed on the plants. The three years of trials have been limited to CL111, but she said more variety testing needs to be done. She said a rice plant’s increased nutrient uptake from mycorrhizae results in more biomass, which could help with the production of more panicles to compensate for the losses from insects. Even though mycorrhizal fungi did not translate to increased insect resistance in this study, the increased yields from the tolerance experiment open a new window to keep working on the effects of this fungi on rice plants. She also is looking at identifying genes in rice that activate chemical responses to pathogens and insects. For the first time a researcher tested a field-scale rice seed treatment of jasmonic acid for its potential to impart resistance against insect pests. She said her work in 2017 showed that seed treated with the material showed fewer weevil larvae than untreated seed. The testing in 2018 did not show a difference in weevil populations, but she suspects it was because the jasmonic acid dissipated during the long lag time between the seed treatment and flooding, which occurred because of an unusually cold spring. The highest reduction of weevil populations came with the use of jasmonic acid in tandem with Karate insecticide, she said. Jasmonic acid does appear to delay heading of rice by a few days, she said, and it does tend to result in decreased biomass. “There is no significant reduction in grain yield,” she said. Kraus said it is possible that using a growth hormone could offset the biomass reduction. LSU AgCenter researcher Manoch Kongchum is studying nitrogen-use efficiency and yield for rice grown under three different irrigation protocols. In the study Kongchum is comparing conventional delayed flooding with two other methods — alternate wetting and drying and semi-aerobic conditions. Preliminary results in 2017 showed that alternate wetting and drying reduced the amount of irrigation water by 31 percent. However, this practice reduced grain yield by 4 percent. In 2018, the alternate wetting and drying water management practice reduced irrigation water requirements by 50 percent and resulted in a 3 percent yield increase compared to conventional, delayed flooding. The yield difference could be attributed to rainfall. The 2017 rainfall was recorded at 32 inches, but only 12 inches in 2018. Because of the excessive rainfall in 2017, the alternate wetting and drying plot was watered only once, but in 2018 it was irrigated four times, Kongchum said. The study used CL153 and the hybrid CLXL745 in 2018. The 2017 study used CL153 and CLXL729. Kongchum said the project will be continued for 2019 at the AgCenter H. Rouse Caffey Rice Research Station. Then it will be conducted on a larger scale at a farm. “The research will be continued in order to determine the best option on a large farm scale to maximize profit with less resources or water requirements,” he said. Kongchum also is studying the differences in methane gas released from the different methods of growing rice. The agronomy project under Dustin Harrell, LSU AgCenter rice extension specialist, is an all-encompassing series of studies aimed at improving production efficiency and increasing yields. He said the optimal nitrogen rate, time of application and number of fertilizer applications have been studied for furrow-irrigated rice production. Work in 2018 showed that the optimal fertilizer timing was three split applications seven days apart. In addition, he said, the 2018 work showed that an additional 50 pounds of nitrogen was needed for furrow-irrigated rice compared to conventionally flooded rice. Harrell said a drone has been used to capture reflectance data of rice fields, which was compared with data obtained from a Greenseeker sensor to find if there is a correlation between the two devices in an effort to develop a midseason nitrogen rate calculator. “We hope to have a new midseason nitrogen fertilizer recommendation calculator using this technology within five years,” Harrell said. He said improved ratoon management is another objective of the agronomy project. He wants to know if fertilizer recommendations need to be modified if stubble management is done. Harrell said he also is studying the use of gibberellic acid in the first crop to enhance ratoon yield. Previous work in Louisiana and in Texas has shown that gibberellic acid can increase second-crop yields in some years. Harrell also conducts volatility studies to measure gaseous losses of nitrogen from fertilizer applications in the field. His lab also has the capability to determine gaseous nitrogen losses from different soil types. Anne Idsal, regional administrator for the U.S. Environmental Protection Agency, at right, watches rice planting by Dustin Harrell, an LSU AgCenter rice extension specialist. Idsal visited the H. Rouse Caffey Rice Research Station in March to learn about the challenges faced by rice farmers. Harrell informed her about the problem of blackbirds feeding on mature rice, and he also detailed the threat to crawfish posed by apple snails, an invasive species. Idsal also toured the station to learn about research being conducted and genetic marker technology. Mike Strain, secretary of the Louisiana Department of Agriculture and Forestry, joined Idsal on the visit. During the station’s field day, Idsal was among the speakers, and she said the EPA has become more focused on problem-solving.